When I was a child, many years ago, I was very lucky, on a holiday to the Southern most tip of Spain to visit North Africa. For a child crossing the Straits of Gibraltar with dolphins leaping around the prow seemingly spurring us onwards, it was and for all I know, still is, a magical journey to a beautiful land. There were camels in the gardens of our hotel and my sister and I got to take a short ride on a very gentle female, accompanied by her baby complete with cartoon eyelashes. I remember the sights, sounds and smells of the markets and the statuesque Berber people. As a child I noticed little of the cuisine but there is one scented memory which, like Marcel Proust's lime soaked cake crumbs, calls me back there in an instant; the smell of mint tea. This recipe for stuffed dates is normally accompanied with the same fragrant and typically Moroccan drink. I've chosen the variety Deglet Noor to use in this recipe, which with its elegant tapered shape and soft translucent honey colour, well deserves its name; 'finger of light'. Dates are thought to be one of the oldest cultivated crops and interestingly enough for this gluten-free recipe, are often referred to as 'the Bread of the Desert'. 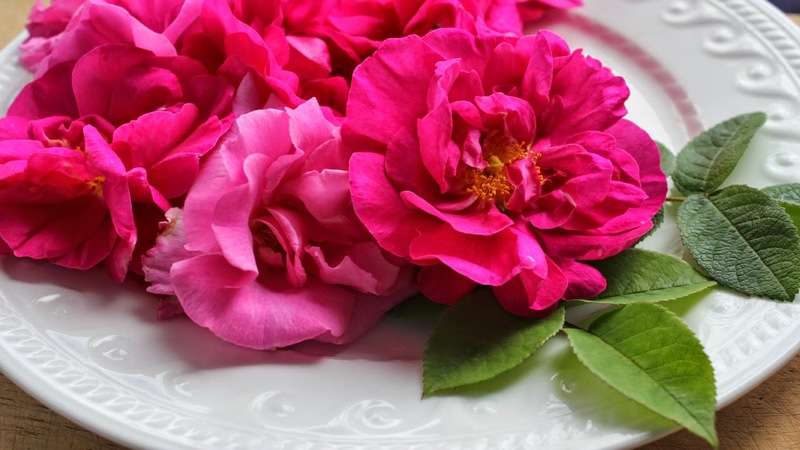 I make my own rose water as I have a whole garden full of old variety rose bushes including those damask roses traditionally used to make rose water and for culinary use. If you do not have access to organic roses but want to use rose water I'm including here a couple of links, from the two major and traditional rose growing countries: Morocco and Bulgaria. Both rose waters are designated as food-grade but only one carries USDA official organic certification. If you want to know how to make your own then check out the link at the end of this article, where I show how to make and use it medicinally. It was only when I was making up the stuffing that I noticed the pistachios I'd purchased, the only ones on offer in my local organic store, were salted. Here, in France, pistachios are mostly eaten as an accompaniment to an apéritif. We both tasted the mixture and pronounced it delectable, rather similar to caramel au beurre salé but with more flavours and textures from the hint of rose to the crunchy pistachios. However, the original recipe would be made with unsalted pistachios but when I checked several other recipes...they added salt!. With a sharp knife make an incision in the dates large enough to remove the pit. Open the date wider using the thumbs. Melt the butter, remove from the heat and then add the rose water and the chopped pistachios. Add the sugar and mix well. Use a potato masher or end of a rolling pin (I used the latter) to obtain a smoother 'dough'. Divide the mixture into 18 and using a teaspoon, stuff the dates. Place them in a cool place. After a couple of hours press the dates more firmly together to make sure the filling is safely in place. Sprinkle with a few chopped pistachios and serve immediately. I have to say that this was the first time I'd made these, as normally I stuff dates with home-made marzipan. This recipe was absolutely delicious and I'm glad I only made six because Andy reckoned that once he'd started eating them, it had been hard to stop! He also admitted he could have eaten all of them!